For those that follow my Instagram Feed or Facebook Page, you will know just how much I adore K-Mart. So much so, that one of my favourite times of the week is Thursday night grocery shopping when I can nip next door to Kmart after I am done. I tell you K-Mart is the ultimate money pit for me, I cannot leave that place without buying something - most of the time it is something I knew ever knew I needed - anyone else do this?!! I was told a few months ago from a very reliable source to expect big things in the home wears department in August. Since then I have been stalking my local store to see the new range, and I haven't been disappointed one little bit. Today the new Home Living Catalogue came in the post and I couldn't read it fast enough (1000 times over). You can access it here online if yours still has not arrived (or if it was soaking wet like mine!). All items are supposed to be in store as of Monday 4th August, but I have found many to already be on shelves now. There are SO many things that I love, want and need, here are just a few of my favourites. We already have a White Hall/Entry Table, which I purchased from Gumtree a few years ago. It is in a desperate need of a paint touch before it moves to our new entrance area, once the extension is done. I think buying this beauty for $30.00 is going to be easier (and probably cheaper) than a paint job! I went mad for the other sets that Kmart released back in 2012. But the new designs have me working out ways to store these in an already busting plate cupboard! 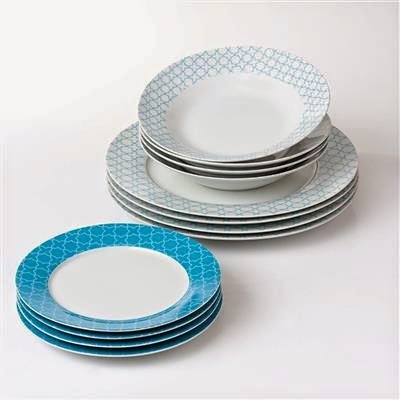 The new sets are available in the below Trellis Style and a Polka Dot version too. A 12 piece set is only $15, can you believe it?! I will let you in on a shocking secret, we don't own a single coffee table in our house! With a baby and a toddler (sharp corners), we have managed to go without... til now! 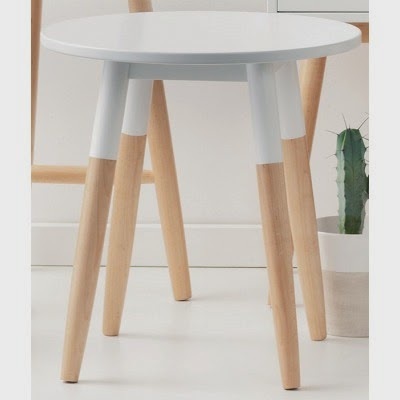 This side table is the perfect size, shape, colour and price for me. I have it sitting in my garage ready to put together so watch this space folks! 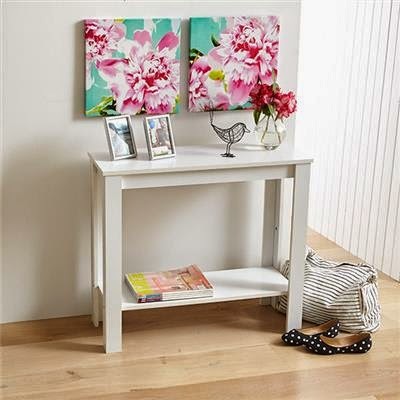 The side table is only $29 and comes in a bedside table and bar stool too. Seriously where on earth were you sweet ottoman when I needed you in my nursery 6 months ago?! This is $29 and comes in red, charcoal, teal and the natural colour - which I adore. Anyone else hoping he was for sale for $8?!!! So those are my favourites - what are you planning to buy? Or what have you bought? Love to hear all about it or see some pictures of your buys in action.... It goes without saying that I am not sponsored by K-Mart buy boy do I wish I was!! Thanks for sharing Allison! 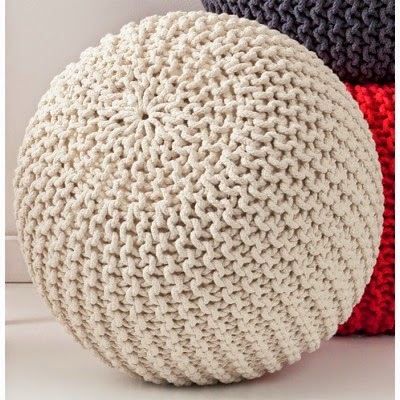 Just had a browse online of the catalogue..love the knitted ottoman as well! Also want to see the blue scallop rug in person and you've sparked my interest in the hall table as well. I too am a huge Kmart lover. So many great bargains and the quality seems to be getter better too.